Number 4 Lumiere D’Hiver Super Comb Prep & Protect, £20, was one of my favourite Birchbox finds of 2014. I'm still getting through the little travel size which came in one of my boxes, but it’ll be an instant repurchase for sure! 100% vegan, Sulphate and Paraben free, it’s great for spritzing through your hair before styling (or even leaving to dry naturally!). It effortlessly works to strengthen, repair, de-tangle and tame flyaway hairs, all whilst being nourishing and protecting. I have quite a stash of hair oils – they’re one of my favourite products for keeping my hair deliciously soft and healthy, but my favourite for over the past couple of years has been the coveted Ojon Rare Blend Oil Total Hair Therapy, £28.49. Using potent hand-picked natural oils known for their healing properties, Ojon Rare Blend Oil works to protect, nourish and transform dry, dull and damaged hair. Every time I use this stuff, my hair feels amazing. It lasts forever, too, making this one well worth the repurchase (full review here). I'm a big fan of Bumble & Bumble and 2014 was the year I delved into the huge range of styling products (instead of just sticking to my shampoo and conditioner favourites!). Bumble & Bumble Thickening Dryspun Finish, £21.50, is one of my most reached for styling products, the quickest fuss-free way to achieve thicker looking hair. I love spritzing this through my hair before using nothing but my fingers to add a touch of volume and style. I'm almost at the end of my first can – and it’s a product I’ll definitely be adding to the repurchase list! Don't forget you can snap this must-have up with 20.15% off until January 12th with the discount code ESCENTUAL2015, which can be used site-wide to grab 20.15% off of your beauty shop! (Full review here). Another must-have product for me is the Ojon Revitalising Mist with Ojon Oil, £20.50. Great for applying straight from the shower on damp hair, it utilises fortified Ojon Oil to refresh and revitalise dull, lifeless hair. Working to de-tangle and tame flyaway’s, it leaves my hair feeling incredibly soft and stronger, all whilst being light-weight – which is perfect for my fine hair (full review here). Last but not least, and the only budget pick in my favourites of 2014 is The Body Shop Grapeseed Glossing Serum*, £7. The first couple of times I tried this serum I was completely blown away by just how effective it is. Aiming to smooth hair, providing a natural and healthy looking shine, this stuff makes my hair feel softer, healthier and happier. Did any hair care products stand out for you in 2014? Let me know! And if you've tried any of my favourites, I’d love to hear your thoughts on them! I've ran out of my Oribe dry texturising spray and I've heard the Bumble and Bumble dry spun finish is just as good so I'll be picking up this next. 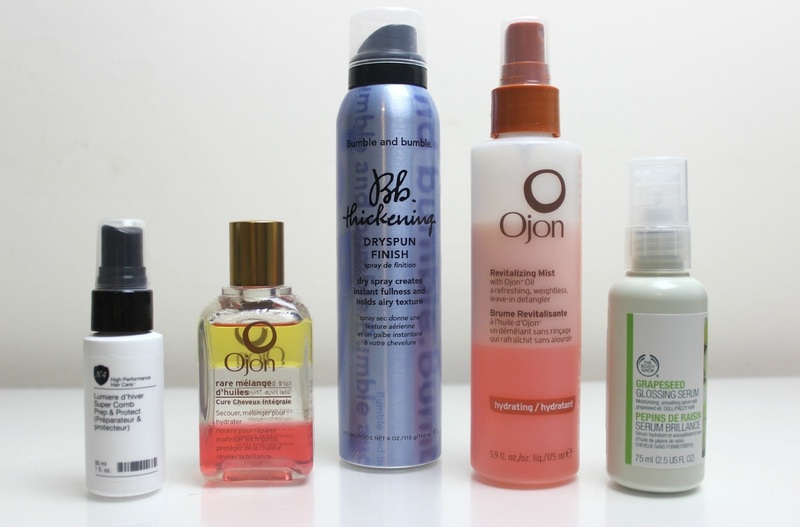 I'd love to try some products from Ojon, I've heard it's a great brand! Ojon are fast becoming a top hair product to try. I'm such a hair snob after working in the salon and using high end brands that I found always worked amazing, I hate using cheaper products that don't work. ( not that price dictates a good product.) I've been hearing lots about Ojon lately with their cleanse conditioner and your 2 products mentioned. Definitely a brand I'll be trying me thinks! Sounds like a bunch of great products, i'll be sure to check them out myself! Thanks for the recommendations! I'm still yet to try anything from bumble and bumble but I'm really intrigued by their thickening dryspun finish and after reading this it's going on my wishlist! Defiantly need to make sure I pick up more Bumble and Bumble this year. I just came across The Body Shop Grapeseed Glossing Serum last year an instantly fell in love. Defiantly going to give Ojon a go. Thanks for sharing. I had a sample of Ojon oil and really loved it so was thinking of giving it a try.